The English Quintet is composed of any number of 5-line stanzas with the rhyme scheme ababb cdcdd, etc. The number of syllables may vary and there is no requirement for meter, though they are often written in iambic pentameter. In this example, the syllable count is 4/8/4/8/8. So, there's your challenge for the week. I hope you'll join me in writing an English quintet. Please share a link to your poem or the poem itself in the comments. I was saddened to hear of the death of Francisco Alarcón last week. I had the pleasure of interviewing him for one of my National Poetry Month series on Poetry Makers. If you don't know him or his work, his obituary contains some lovely thoughts. Reading Rockets conducted a nice interview with him. It is below. Finally, I thought this might be a good time to share again his Poetry Makers interview. This was originally posted April 3, 2010. Several years ago while looking for some bilingual poetry for a student teacher, I stumbled across the book Iguanas in the Snow and Other Winter Poems / Iguanas en la nieve: y otros poemas de invierno, written by Francisco Alarcón and illustrated by Maya Christina Gonzalez. The vibrant art on the cover reeled me in, and once I was inside the magic of the poems enchanted me. Here's one I suggested she use with her ESL students, all recent immigrants, all Spanish-speaking. Before moving on to Francisco's interview, take a few minutes to listen to him talk about his family and read some of his poems. Francisco: I started to write poems when I was around 13 years. I was in Guadalajara, Mexico, and I wanted to put down in writing my grandmother’s songs she used to sing. I thought the songs were part of the oral tradition but when I found out they were her own compositions that she had never written down, I decided to transcribe them. Since I don’t have a very good memory, I would make up for a line or two that were missing in the traditional ballads that usually have stanzas of four verses each. I published my first book of bilingual poems for grown-ups in 1985. 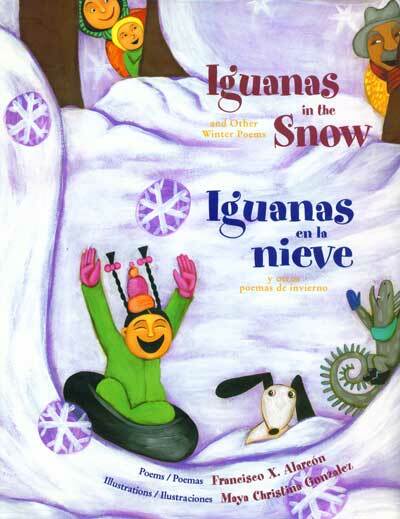 Later I became aware that there were almost no books of bilingual poems children written by any Latino poet in the United States, and so I wrote and published my first book of bilingual poems for children in 1997, “Laughing Tomatoes and Other Spring Poems” (Children’s Book Press). I published three additional books to complete the “Magical Cycle of the Four Seasons” of the year. I wrote a book of bilingual poems for children about dreams. “Poems to Dream Together” (Lee & Low Books, 2005). 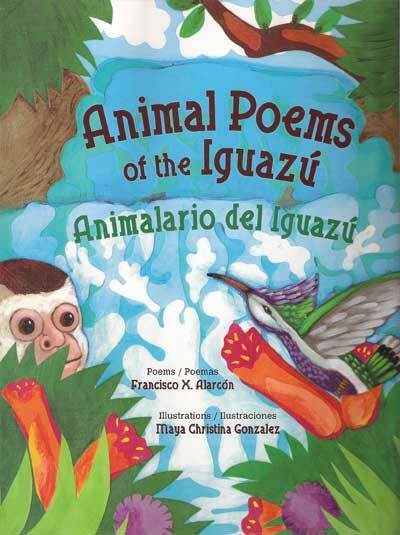 My latest book, “Animal Poems of the Iguazú / Animalario del Iguazú” (Children’s Book Press, 2008) is a celebration of a natural wonder of the world. Francisco: I write poetry for children in the same way I write poems for grow-ups. My signature poetics is that “less is really more,” that is to say, that few words in a poem can express a great deal and some times better than long texts. I believe that poems can only be complete when they are read by readers or are heard by listeners. My poems demand readers and listeners who are “accomplices” of the author and can make sense of my poems that I believe are incomplete without the participation of readers and listeners. This is why I enjoy immensely reading aloud my bilingual poems to children during school visits or during poetry presentations in public libraries or community centers. In the past, I used to present my poems together with slide shows, but last year, at the urging of the organizers of “Words Take Wing,” an annual literary presentation of children sponsored by the School of Education and that takes place at the Mondavi Performing Arts Center at the University of California, Davis, I began doing power point presentations in which my poems are projected to a screen together with visual images from my children’s books. I did this for the first time at a morning presentation at the Mondavi Center together with artist Maya Christina Gonzalez, the illustrator of five of my children’s book. There were about 1,000 children and teachers in the audience in one of the largest performance theaters in Northern in California. It was a smashing great success and as a direct result, I was invited to visit about 20 schools in the surrounding areas in the following months. I see this as an integral part of the poetic process that starts with my solitary writing of the poems, then includes the edition and publication of the books of poems with artwork by inspired artists and designers, and finally extends to the actual presentation of the poems to children, their families and teachers, and the public in general. This process brings lots of joy and satisfaction to me as a poet and educator. Francisco: I began writing poems as a way to retrieve family memories, first by writing down the songs composed by my paternal grandmother in Guadalajara, Mexico, and then, by giving testimony of my family and personal experiences. After I do presentations of my poems to children, I usually ask children if they have any questions or comments, and often I receive some very insightful comments or questions from children, like the one I received at “El Festival del Libro” on March 14, 2010, in Sacramento. A nine-year old girl commented that she noticed that all the poems I had read were in some way connected to my own life. I told her that I appreciated very much her insightful comment, and that yes, for me, poetry is an extension of my own life; that my poems are direct reflections of life and reality that I find fascinating, mesmerizing, and magical; that although I celebrate the imagination of other poets and writers, my poetry is a celebration of our surrounding reality, than more than being fictitious, my poetry is above all a testimony of life. Francisco: I had the privilege of having excellent education opportunities in my lifetime. I was a scholarship student that attended El Instituto de Ciencias, an elitist high school run by the Jesuits in Guadalajara, Mexico. Since I was in the Dean’s List, I was given the keys to a wonderful literary library of more than 3,000 books that was at my personal disposal. This library was a paradise for a teenager interested in devouring books. Then after I moved to California and went to college, I took many solid courses on Latin American and Spanish literature and got a BA in Spanish and History from California State University, Long Beach. For five years I undertook graduate studies at Stanford University, in the Department of Spanish and Portuguese. I consider Fernando Alegría, a Chilean poet and novelist who was the cultural attaché in the Chilean Embassy during the Allende government, and a professor at Stanford, one of my literary mentors. When I was a Fulbright scholar in Mexico, I met and became a very close friend of Elías Nandino, who at 80 years old was a survivor of generation of Mexican writers known as “Los Contemporáneos.” Elías Nandino became my mentor in poetry and life. While attending Stanford, I moved and lived in the Mission District in San Francisco, California, and met and collaborated with many great poets and writers like Juan Felipe Herrera, Lorna Dee Cervantes, José Antonio Burciaga, Lucha Corpi, Jack Hirschman, Alejandro Murguía, among others. Being faculty to some intensive poetry workshops like “Art of the Wild” organized by Jack Hicks, professor fo UC Davis, in Squaw Valley near Lake Tahoe in California, taught a great deal about poetry. I had the chance to interact with Gary Snyder, who is one of the main teachers of poetry of my generation. Above all I have to say that life is the teacher, mentor, inspiration, and main theme of my poetry. Francisco: I am always very puzzled by poets who say that they write poetry every day at a certain time. I have never been able to do so. I write poems really in a fit of passion. I can go on days and months without writing anything and then suddenly poems come rushing to me unexpectedly. I have learned to leave everything aside and become a medium for the poems. Whole collections of poems have come to me in a matter of few days. 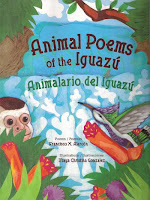 Most of the bilingual poems my latest book, “Animal Poems of the Iguazú / Animalario del Iguazú.” came to me while I was visiting the Iguazú National Park in Northern Argentina. So, I can say the poems were written in situ. For some unknown reason, I write most of poems by hand on yellow lined paper blocks. Maybe I see myself as a secretary taking dictation for a poetic brief instead of a legal one. I am so old fashioned; I still use cursive handwriting; for me, the movement and cadence of writing by hand are very inspirational and conducive to poetry. Francisco: This is very difficult question to ask to poet like me. It’s like asking a father about his favorite son or daughter. I celebrate each poem of every poetry book as being unique and part of a large book that I have been writing all my life. For me poetry somehow escapes the realm of the possible. I read some of my poems I wrote decades ago as if I had written them yesterday, and others that I wrote recently I read them as if someone else had written them; they keep surprising me. Francisco: I have been working on two books of poems for children. The first one is collection of bilingual poems about the Mesoamerican origin of Chocolate. I have submitted the manuscript to several published and I have been told by editors that although they loved my poems they found that the subject matter, chocolate, is really a taboo subject for children’s books, because chocolate supposedly makes people obese. But my poems deal with the indigenous origins of chocolate and not about the sugar that was later added to chocolate. I sent the manuscript to a university press that is still considering it. I know that when my book of chocolate poems comes out it will do really well among children, educators, critics, and the public in general. The second book is a collection of poems about Aztec calendar. I have titled this unpublished book, “Tonalamatl: Book of Days / Libro de los días.” This is a trilingual collection that includes short poems for the 20 days in the Aztec calendar in Spanish, English, and Nahuatl, the language of the Aztecs. The poems in Nahuatl are translations done by Natalio Hernández, one of the most distinguished Mexican poets who write in Nahuatl in Mexico. This book is directed toward middle school children and young readers and is a groundbreaking literary project because it will be the first time that a picture book will be published in English, Spanish, and Nahuatl in the United States. I am in the process of looking for a publisher. Francisco: In English, two of my favorite poets are E. E. Cummings and Langston Hughes. In Spanish, I would say Federico García Lorca and Pablo Neruda. Francisco: I don’t have a particular place for writing. I have written many of my poems on my kitchen table and on small notebooks as I walk around or right after I wake up in the morning, also in the middle of night still on my bed. Francisco: I would nominate Pat Mora, who has published so many beautiful children’s books. Francisco has done such a wonderful job describing his art that I can't add much more. I wish I had thought to ask if he composes in Spanish, English, or both. I'm not sure it matters, but to someone who is sadly monolingual, I am intrigued by those who can "think" in a second language. And frankly, I struggle to write decent poetry in my native language, so reading Francisco's work fills me with even more admiration and wonder knowing he's working in two languages. I'd like to end this remarkable interview with two of my favorite poems. The first can be found in Poems to Dream Together / Poemas Para Sonar Juntos. The second can be found in From the Bellybutton of the Moon and Other Summer Poems / Del Ombligo de la Luna: Y Otros Poemas de Verano. All poems ©Francisco X. Alarcón. All rights reserved. To learn more about Francisco, visit these sites. Godspeed, Francisco. You will be missed. Schools here are closed for a preemptive snow day. It doesn't look bad yet, but we are hunkered down for the weekend and hoping we don't lose power. Today I'm sharing a poem from the book Smoke and Steel (1922) by Carl Sandburg. SNOW took us away from the smoke valleys into white mountains, we saw velvet blue cows eating a vermillion grass and they gave us a pink milk. Six bits for a sniff of snow in the old days bought us bubbles beautiful to forget floating long arm women across sunny autumn hills. More, more—a yen is on, a long yen and God only knows when it will end. In the old days six bits got us snow and stopped the yen—now the government says: No, no, when our bones cry their telegrams: More, more. The blue cows are dying, no more pink milk, no more floating long arm women, the hills are empty—us for the smoke valleys—sneeze and shiver and croak, you dopes—the government says: No, no. I do hope you'll take some time today to check out all the wonderful poetic things being shared and collected by Tara Smith as A Teaching Life. Happy poetry Friday friends! Long ago I read a post at the blog How A Poem Happens. In it, poet Idra Novey shared her poem Trans and described its creation. In the poem she used the prefix trans- as the title of her poem and created sections that begin -late, -gress, -mogrify, -form, and -scend. I love the idea of taking a prefix and using it to form a series of words, each their own piece of a whole. If you need help generating a possible word list, try More Words. Enter your prefix or word of choice and click search for words. Scroll down the page (past the definitions) until you find the link for list all words starting with __. You'll find this a helpful tool. So, there's your challenge for the week. I hope you'll join me in writing a prefix poem. Please share a link to your poem or the poem itself in the comments. The rime couée is a French poetic form, written as an number of sestets. The poem begins with an eight syllable rhyming couplet, followed by a six syllable line, another eight syllable rhyming couplet, and a final six syllable line. Some list the rhyme scheme as aabaab, ccdccd, etc. Others suggest the rhyme scheme is aabccb, ddeffe etc. Choose the one that works for you! You can read more about this form at Poetry Magnum Opus and The Poets Garret. So, there's your challenge for the week. I hope you'll join me in writing a rime couée. Please share a link to your poem or the poem itself in the comments. Welcome back! If you haven't been following the crown or have come here directly from the Poetry Friday roundup, do jump over to Laura Purdie Salas's blog where this crown started and then follow the bread crumbs through the blogosphere to each sonnet in the crown. If you do that, you'll end up right back here. The sixth sonnet in the crown was written by Tanita Davis. She left me with a bit of magic and alchemy to wrestle with. And remember, since this is the last sonnet in the crown, I also needed to end with Laura's first line. Here is the final sonnet in the crown. Pandora’s box we hold now, God forbid. The world escapes when we unhinge the lid. **Time out for a bit of science - If you've been following the news, you'll recognize that this last sonnet is about the now complete 7th period of the table. The four new elements “discovered” were, in fact, synthesized in a lab. Actually, all the elements from 95 to 118 are synthetic. Once formed they very quickly decay into simpler elements. I hope you'll take some time to go back and read once more the contributions of each poet. Here is where you'll find the posts by each participant in the crown, in the order they were written. Finally, and at the prodding of my sisters, I am sharing the full crown here. Solutions for our planet's fragile life? A cancer beat? Malignancy reversed? Or data, fused and used, a sharp-edged knife? Will science break us down or set us free? What bonds secure us here in time and space? the downfall of the species and our race? what other treasures will the chart reveal? I think, and choose my fate by noble shine. A lilac glow when placed in voltage fields! A barrier, so wine may age sans air! Unseen, from dust, our Constitution, shields! a “kinder” end to fowl. “Inactive”? NOPE. Those who search for matter (dark) target you. A science lover, choosing in the night. do well to mine fourth row intelligence. is last with elements completely stable. radioactivity is down the table. make stainless steel and artificial legs. 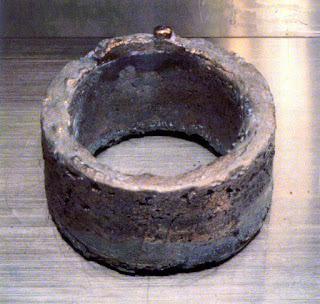 It’s odd to think it’s metal, and not stone. that we bite down on, gnash and grind at night. alloyed with other charms to fend off blight. you’d never know they weren’t a part of us. the framework for our aches, the messy truss. 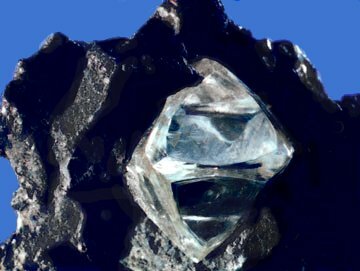 Rubidium -- are we made up of you? And cadmium and antimony too? so there’s no fault, no consequence undue. Don’t blame the elements for our demise. Don't blame the elements for our demise. Will strengthen, if the cure we can withstand. Both toxic radon and earth magnets find. Can manufacture health for humankind. our mettle tested, move from lead to gold. I can't begin to tell you how much fun this year of writing has been, and capping it off with a crown has been such a treat. Perhaps most exciting is that even though the year has ended, we've all signed on to continue this crazy adventure. Thank you, my sisters, for one of the best birthday gifts ever. I do hope you'll take some time today to check out all the wonderful poetic things being shared and collected by Tabatha Yeatts at The Opposite of Indifference. Happy poetry Friday friends! My poetry sisters and I are wrapping up our year of writing with a crown sonnet. This particular project holds a special place in my heart because the very first sonnet I ever wrote was because I was invited to participate in the first crown project with this group. All these years later, I'm still energized, excited, humbled, and honored to work with these women. I'll also admit to being just a bit giddy over the topic of the crown. I never imagined my sisters would choose the periodic table! The first sonnet in the crown was written by Laura Purdie Salas. She kicked things off beautifully and left me a terrific final line to begin with. Without further ado, here is the second sonnet in the crown. Sara Lewis Holmes took over from here. I hope you'll head to her blog next to see where this goes! I'll not conclude my Poetry Friday contribution yet, as you'll circle back around to me when this thing comes to a conclusion. I hope to see you back here soon! Iroha mojigusari is a Japanese form of an abecedarian poem. Here's how it is defined in A Poet's Glossary by Edward Hirsch. The Japanese iroha mojigusari (literally “character chain”) is a specialized version of the abecedarian.The first letter of the alphabet kicks off the first line and the second letter of the alphabet concludes it. The third letter starts the second line and the fourth letter finishes it. This continues until all the letters of the alphabet have been used in order. While working on this I found that finding words ending in specific letters to be difficult. Try wordHippo for help with this. Under select option choose "words ending with" and search for the letter you need. You'll find it brings up a helpful list of words. So, there's your challenge for the week. I hope you'll join me in writing an iroha mojigusari. Please share a link to your poem or the poem itself in the comments. Fra Giovanni Giocondo was a priest, scholar, architect, and teacher. You can read more about this renaissance man at the Catholic Encyclopedia. This letter was written to his friend, Countess Allagia Aldobrandeschi, on Christmas Eve, 1513. I salute you. I am your friend, and my love for you goes deep. There is nothing I can give you which you have not. But there is much, very much, that, while I cannot give it, you can take. No heaven can come to us unless our hearts find rest in it today. Take heaven! No peace lies in the future which is not hidden in this present little instant. Take peace! The gloom of the world is but a shadow. Behind it, yet within our reach, is joy. There is radiance and glory in darkness, could we but see. And to see, we have only to look. I beseech you to look! Life is so generous a giver. But we, judging its gifts by their covering, cast them away as ugly or heavy or hard. Remove the covering, and you will find beneath it a living splendor, woven of love by wisdom, with power. Welcome it, grasp it, and you touch the angel’s hand that brings it to you. Everything we call a trial, a sorrow or a duty, believe me, that angel’s hand is there. The gift is there and the wonder of an overshadowing presence. Your joys, too, be not content with them as joys. They, too, conceal diviner gifts. And so, at this time, I greet you, not quite as the world sends greetings, but with profound esteem and with the prayer that for you, now and forever, the day breaks and shadows flee away. This is the version of the letter I've been acquainted with for some time. Bartleby has a similar version of the letter with this interesting note. The British Museum stated in 1970 that it had “proved impossible” to identify Fra Giovanni, the purported author of this letter. 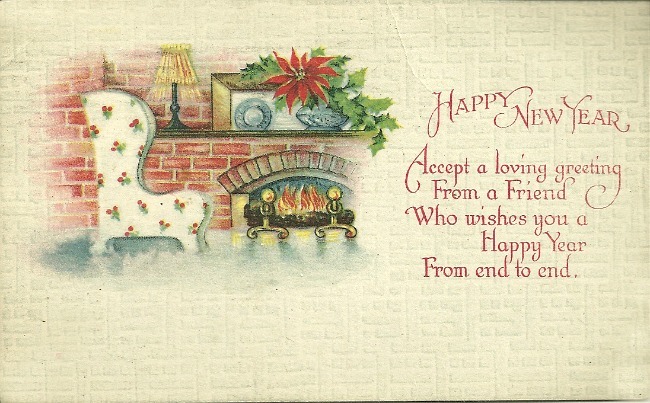 This was published, probably in the 1930s, “with Christmas Greetings” from Greville MacDonald, son of novelist George MacDonald, and Mary MacDonald. You can find an excerpt of this letter in a beautiful print in the form of an illuminated manuscript at Prose and Letters. I do hope you'll take some time this weekend to check out all the wonderful poetic things being shared and collected by Mary Lee at A Year of Reading. 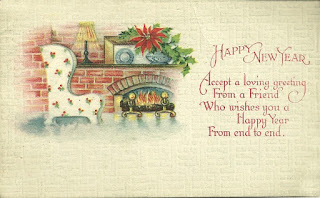 Happy new year to all and happy poetry Friday friends!